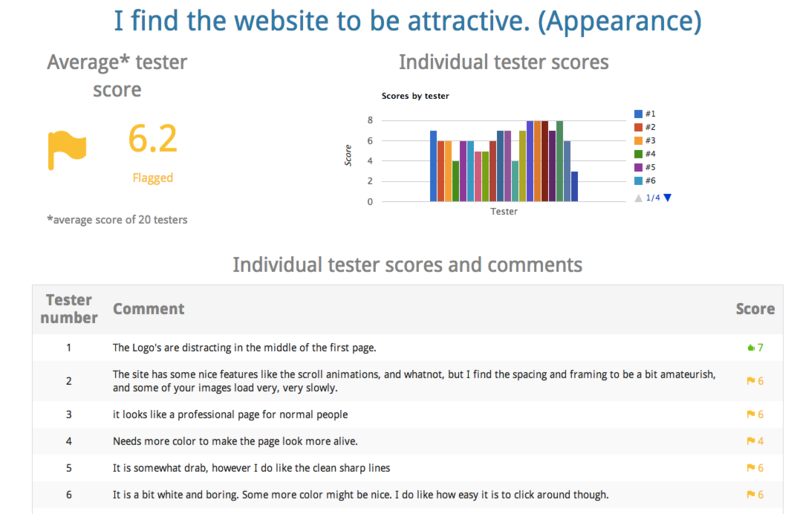 Discover what objective viewers think of your website design, navigation, credibility, appearance and more using our website testing application. Choose from our bank of value statements that cover different evaluation categories such as navigation, credibility, appearance, etc. Value statements are questions, changed to positive statements. For example, the question, "Is this website easy navigate" appears in value statement form as "This website is easy to navigate." We use the acryonym for "value statement" (VS) to conserve space on certain pages. Our premium service has full-feature integration with a crowdsourcing platform where we provide individuals to complete your tests. Our basic service has all the same features, except you need to find your own testers. We are offering free credits for our premium service, by invitation only. Drop us a note with the form below and give it a try! Ratings, written responses and other summary data are displayed through a combination of tables, graphs and indicators. Whether you use our built-in dashboards or download and crunch the data yourself, we've got you covered. What's a re-test and how is it used? Re-testing has similarities with A/B testing but has a few key differences. Re-tests occur in sequence one after another while traditional A/B tests usually occur simultaneously. Our re-test functionality allows you to compare iterations of your site with several criteria at-a-time, whereas A/B tests typically yield a snap reaction between two design choices. You re-test your site because you want to make measureable improvements as you develop or make changes to your site. If you want to take an iterative design approach to developing your site, this tool is for you. Start testing your website now with our basic service. For a limited time, we are offering free credits for our full-feature premium service. Choose from several question categories to design your own website test. Our questions appear in value statement form (e.g. this site is easy to navigate) and reviewers are asked to indicate to what extent they agree with the statement (on a 1 to 9 scale), providing an explanation for why that rating was given. Our built-in integration with industry leading crowdsourcing platform instantly places your test in front of online reviewers who use different browsers and operating systems and who come from different countries. Reviewer responses are usually completed within one day and often times sooner. Ratings, written responses and other summary data are displayed on user dashboards through a combination of tables and graphs. When you re-test your sites (e.g. updated site, alternate design, etc. 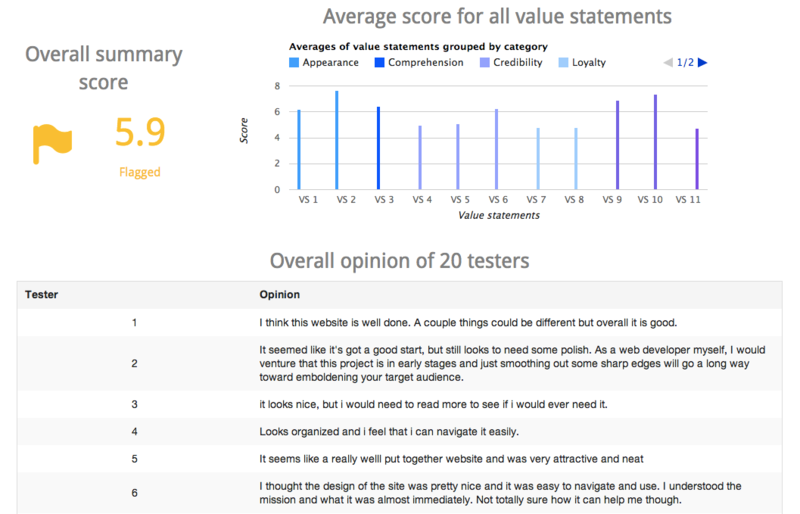 ), our dashboard captures trends and changes between test versions, making the evaluation process as simple as ever. Whether you use our built-in dashboards or download and crunch the data yourself, we've got you covered. Start using the basic service here. Apply for a premium service invitation here. Use our contact form to provide feedback, offer suggestions or ask questions about our service. Have you filled out the premium service invite form? We are giving away free credits on a limited basis. Give it a try! Create an account and start using the basic service by signing up now! You'll still be able to create tests from the question bank, view your results on an analytics dashboard, download results and re-test. All you need to do is share the test link with individuals in your network. Our premium service is open currently open on invite only for a limited number of customers. If you'd like to try it out, drop us a note with the form below. Give it a try!